FILE - Soldiers attached to the 101st Resolute Support Sustainment Brigade, Iowa National Guard and 10th Mountain, 2-14 Infantry Battalion load onto a Chinook helicopter to head out on a mission in Afghanistan, Jan. 15, 2019. A joint counter-Taliban operation in northern Afghanistan Friday killed two American service members and an Afghan partner, officials said. The Taliban “fiercely” resisted the joint raid and ensuing clashes were still continuing in the area, said insurgent spokesman Zabihullah Mujahid. 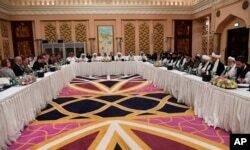 FILE - Photo released by Qatar's Ministry of Foreign Affairs shows Qatari, U.S. and Taliban officials conferring in an undisclosed place in Doha, Feb. 25, 2019, ahead of the latest round of talks with the insurgents aimed at ending the Afghan war. Chief U.S. negotiator Zalmay Khalilzad is scheduled to host his Russian, Chinese and European Union counterparts in Washington Friday to discuss “progress to date in peace talks” with the Taliban.